The second in the STAR WARS: Special Edition trilogy was released on February 21, 1997. Huge crowds of people turned out to show thier support for the Rebellion. Because its makers underestimated the power of the FORCE, this movie wound up competing with its predecessor, STAR WARS, which was released just three weeks beforehand. Two down, one to go. This is a great time to be alive! I had my tickets for this one five days in advance. Once again, I stood in line for an hour just to get a good seat. And once again, it was worth it. 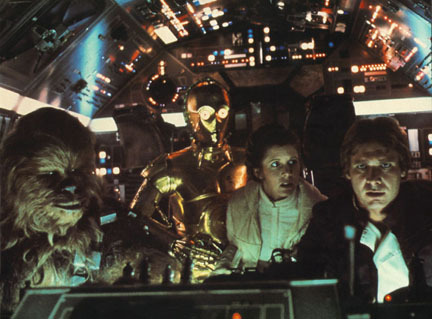 The Empire Strikes Back is usually most people's favorite of the three STAR WARS movies. I think that this is for many reasons. We really start to learn, along with Luke Skywalker, what the FORCE really is and how powerful it can be. Also, the music in this movie is, in my opinion, the best of the trilogy. The chemistry between Han and Leia in this movie is as entertaining as it is captivating. We also see the true scope and grandeur of the Empire (they were by no means localized to the Death Star of Star Wars). We meet Yoda. Han Solo gets frozen. 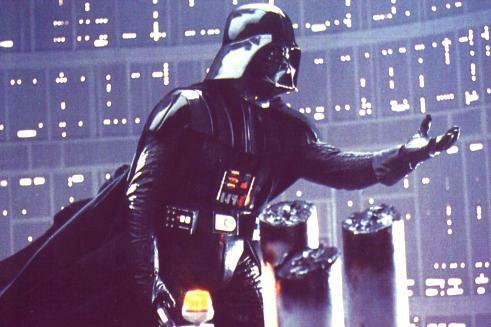 And Luke Skywalker confronts Darth Vader, who promptly cuts off his hand and then tells him "I am your father." Oh no! Did I just spoil everything for those of you who haven't seen it yet? The ice world of Hoth held a few of the new surprises for the Special Edition version. For instance, the Ice Wampa that captured Luke in the ice cave and planned on eating him is seen munching on Luke's tauntaun. So what's the subject of this paragraph? For those of you who answered the ice world of Hoth, good job! The ice world of Hoth is very cool (HA HA!) because of the AT-AT walkers seen to your left. 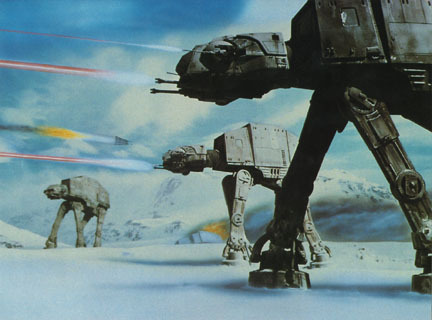 It is also in this ice world of Hoth that we once again see Wedge. He is a fighter pilot who appears in all three of the STAR WARS movies but gets very little performance time. But I like him. I think we all do. Let's here it for Wedge! The added special effects to this Special Edition of THE EMPIRE STRIKES BACK were special. I especially (note: I promise that I will not use the word "special" for the rest of this special review) liked how we were able to fly through the City of Clouds rather than watch a ship fly through. I was so enthralled by these special (I lied) effects, that I made the above special effects scene in java. How would you rate the movie THE EMPIRE STRIKES BACK: Special Edition? For this movie only, I will allow you to vote higher than a 10! There have been 24954 people to visit this page since Fri, Feb 21, 1997. And you are the first person to visit this page today!